Used vs new. They’re still so bright!! You’ll notice this weird bulge under the ball of your foot the first few times you run in them. Not sure if this is really a con since it didn’t really hurt, but I noticed it. I guess this is more of a fun fact. Mileage: First pair retired at ~700 miles after 2 races and marathon training. Second pair still going strong after ~100 miles and a marathon! Bottom line: When I first saw them, I was slightly turned off by the color. Pink/coral isn’t really my thing, and my local store only carries one color. Then I put them on. And it felt like this. Needless to say I’m currently embracing the pink/coral magical footwear, and am currently on my second pair. 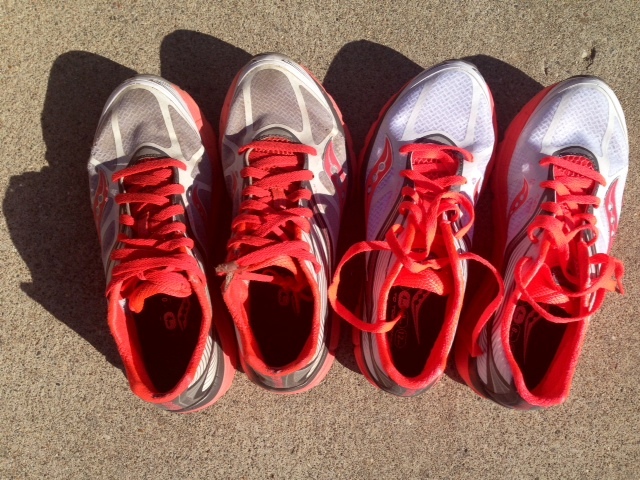 It seems like 700 miles is a good lifespan for a pair of running shoes. I don’t put on that many miles but I think these saucony’s would be a good fit. Thanks for the review and good luck with your races!